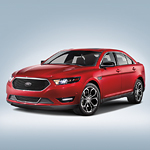 The Ford Taurus has a sophisticated appearance. From the aerodynamic shape of the exterior to the richness style of the interior, you can't help but notice that the Taurus is different from other full-size sedans. The distinctive exterior design has a bold grille, eye-catching high-intensity discharge headlamps and rear LED signature taillamps that amplifies the Taurus' appealing style. The Taurus makes a bold statement and lets everyone know that you have superb taste in choosing the right car! Visit Lithia Ford of Klamath Falls's showroom for a complete presentation and a test drive! It's time to capture the newness that you've been waiting for!